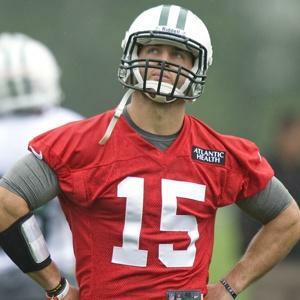 The news around Tim Tebow has been quiet since he was cut by the Jets, but it’s been widely assumed that Tebow is still hoping to catch on with some NFL team. The people advising Tebow, however, may have come to the conclusion that there simply isn’t an NFL team willing to give him a shot. David Fleming writes in ESPN the Magazine that members of Tebow’s camp are privately admitting that his NFL run is probably over. Although Tebow did have some success as the Broncos’ starting quarterback, leading Denver to a playoff win after the 2011 season, Fleming quotes an unnamed scout as saying that even during his best run with the Broncos, the work he put on tape did nothing for NFL personnel people. Among the problems NFL teams have identified about Tebow, according to the report, are that he has a hard time remembering plays, he didn’t run the offense well and got the Broncos flagged for delay of game too often, he struggled to read defenses and he didn’t have the self-awareness to know what he wasn’t doing well and work on improving those issues. There’s also, obviously, the fundamental issue of passing accuracy: Tebow’s career completion rate of 47.9 percent is way too low, and Fleming describes a scene in Broncos practice in which coach John Fox was aghast to see Tebow throw a pass so badly that it landed on the ground far in front of the intended receiver’s feet. Add it all up, and no matter how exciting a season he had with the Broncos in 2011, Tebow just doesn’t look like an NFL quarterback. He and the people around him may be coming around to accepting that. 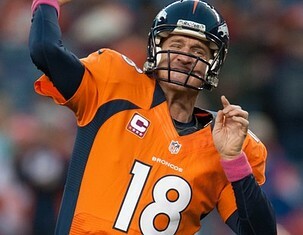 Broncos quarterback Peyton Manning was great last year, but his receivers say he can be even better this year. 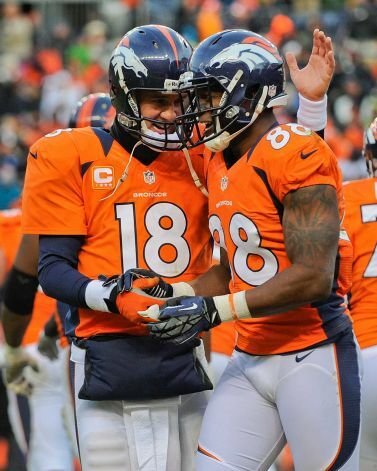 Eric Decker and Demaryius Thomas, Denver’s top two receivers a year ago, both say that they notice that Manning has a stronger arm now than he did last year, as he continues to progress from the neck injury that cost him the entire 2011 season. Thomas said he senses Manning is getting stronger, too, although Thomas added that Manning was already so much better than any other quarterback he had ever played with that anything else is gravy. Save Thomas’s quote about never having a pass thrown to him “on time and stuff” and repeat it as needed for anyone who wonders about the continued unemployment of Tim Tebow. 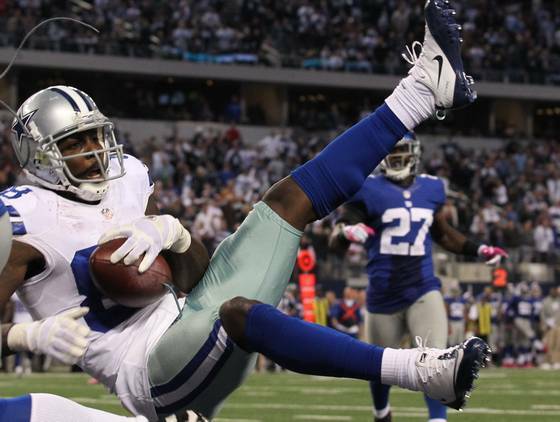 Michael Jordan didn’t have many words for Dez Bryant, after the NBA legend signed the Cowboys wide receiver to represent his sneaker brand. But the few words he said resonated with Bryant. By all accounts, Bryant has done what he’s supposed to do this offseason, but his checkered past made him a risky proposition for an endorsement deal. Then again, the Charlotte Bobcats owner has never been afraid of a wager, and hedged his bets on Bryant by signing a deal that withheld payment from for a year, so Bryant can prove to Jordan he can keep his nose clean. If Bryant does, he’ll get his money in the second year of the deal. Perhaps in exchange, Bryant offered to tell Jordan about what it felt like to get to .500, something Jordan wouldn’t know much about since leaving the basketball court as a player. If you thought you’d never read about Justin Bieber on a football website, well, never say never. It turns out that Bieber and former NFL receiver Keyshawn Johnson are neighbors, and they’re feuding over Bieber’s propensity for driving his Ferrari at breakneck speeds through their gated community. Johnson called the cops on Bieber on Sunday night, according to TMZ, and Johnson also attempted to confront Bieber after Bieber sped past him while Johnson was driving his child home. The confrontation didn’t take place, however, because when Johnson pulled into Bieber’s driveway, Bieber went inside and refused to come out. 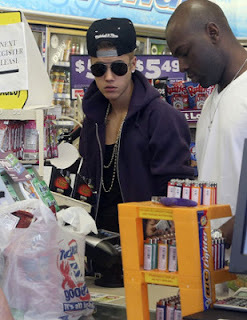 Probably a wise move by Bieber. Joe Theismann’s prostate gives him fits. He thinks LeBron James could do the same to NFL defenses. 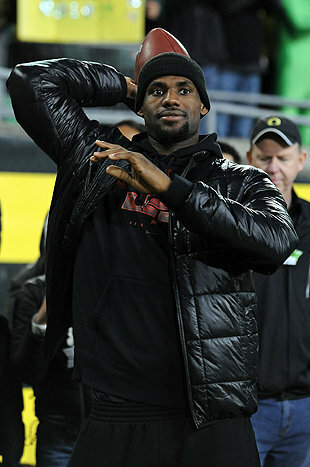 According to Chris Thomasson of FOXSportsFlorida.com, Theismann believes LeBron could play quarterback in the NFL. Not now, but when LeBron is done with playing basketball. After all, most franchise quarterbacks are on the wrong side of 30, with more than a few north of 35. The comments flow from LeBron’s recent musings about whether he could have played quarterback. “I wouldn’t count him out,” Theismann said. “He’s the most tremendous physical specimen in all of sports. I think he’s certainly talented enough. He’s intelligent. He’s like the quarterback on the Miami Heat, but there are so many things [to being an NFL quarterback]. So why is Theismann willing to help James? “I need a job,” Theismann said. Apparently, hawking prostate pills doesn’t pay as much as you’d think. More than four months later, Denver coach John Fox is still being questioned about why he had Peyton Manning kneel down and run out the clock at the end of the fourth quarter of a playoff game the Broncos would ultimately lose to the Ravens. And Fox is still standing by his decision to settle for overtime, rather than let Manning try to drive the Broncos into position for a game-winning field goal. Of course, bad things can happen in overtime, too. Bad things like, you know, losing the game, which is what the Broncos did. But Fox says he can’t be swayed. He has talked it over with everyone all offseason, and he remains convinced that he did the strategically correct thing, even if it didn’t work out in this particular instance. “I’ve debated it with my staff, my wife, myself. I would do the same thing 10 times out of 10,” Fox said. I would disagree with Fox 10 times out of 10, but Fox doesn’t care what I or anyone else thinks. If the Broncos find themselves in the same situation this season, Fox will once again order Manning to take a knee, run out the clock and get ready for overtime. Cowboys owner Jerry Jones made quarterback Tony Romo one of the highest-paid players in NFL history this offseason, and he also said publicly that he wants to see Romo spend more time in the facility and get more involved in the offense. That raises a question: If there were any issues with Romo’s commitment, why give him that kind of contract? But Jones says it’s not about questioning Romo’s commitment. Instead, Jones told Albert Breer on NFL Network that he simply meant that if he’s going to pay someone the kind of money he’s paying Romo, he wants to be certain that player is giving everything he can possibly give to the team. “When you give somebody $100 million, you’d like to get every ounce of anything they can bring to the table to win a football game,” Jones said. Jones said he believes Romo is a great offensive mind who can add a lot to game planning sessions. Romo has led the Cowboys to an 8-8 record in two straight seasons, but Jones says that doesn’t mean Romo is mediocre. 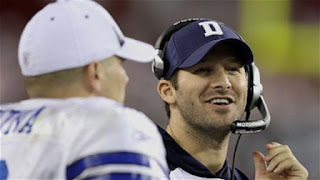 Romo will have to help the Cowboys win a lot more ballgames to justify that contract. A settlement has been reached in the lawsuit filed by two massage therapists against Brett Favre, the Associated Press reported Friday. The lawsuit stemmed from allegations that Favre, who played for the Jets in 2008, sent suggestive text messages sent to one of the masseuses. The Jets and another club employee were also named in the suit. Terms of the settlement were not disclosed by the therapists’ attorney, according to the AP. 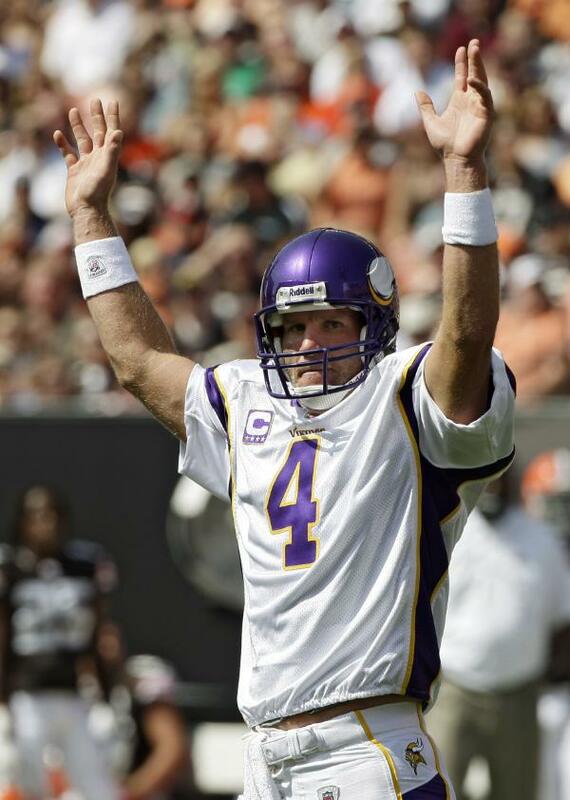 The Jets released Favre, who indicated he was retiring, after the 2008 season. However, the quarterback came out of retirement to play for the Vikings in 2009 and 2010. 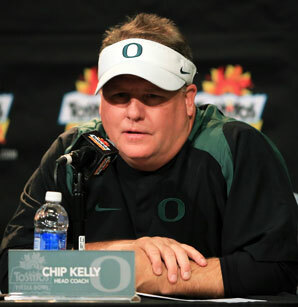 New Eagles coach Chip Kelly has said he can adjust his style and run a different system in the NFL than he ran at Oregon. Former Eagles quarterback Ron Jaworski says he’ll have to. Jaworski, who analyzes film in his work with ESPN, said on 97.5 The Fanatic that Kelly, who has no NFL experience at all, is much more likely to adjust his offense to the realities of the NFL than to revolutionize the NFL by bringing his spread offense to the next level. Jaworski says there are fundamental differences between the way Oregon could exploit weaker defenses in college and the way an NFL defense would attack an offense like Kelly’s. 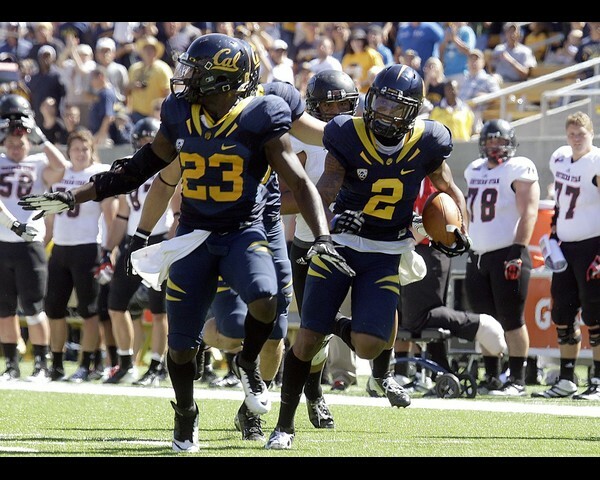 Kelly’s system will certainly be different in the NFL than it was at Oregon. The question is how different. If Jaworski is right, it will need to be very different. 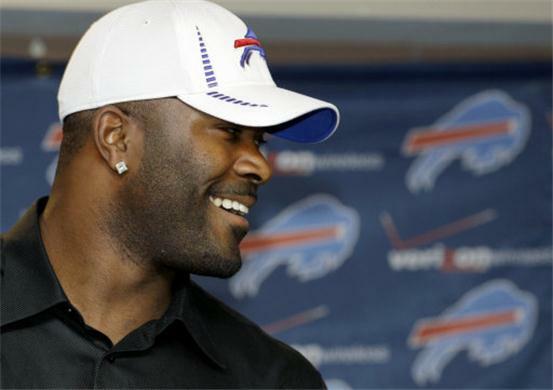 On Monday, Bills defensive lineman Mario Williams tried to explain text messages that had been released to the media by the lawyer representing Williams’ ex-fiancée. It could be the first of many times that Mario must respond or react to things said and done by Tony Buzbee. Buzbee is employing a common, and effective, litigation tactic. Williams has sued Buzbee’s client on grounds Buzbee deems to be frivolous and unwarranted, and Buzbee will do everything he can to make Williams regret that decision. For more proof of Buzbee’s plan, look no farther than his recent comments to Tim Graham of the Buffalo News. Buzbee justifies an aggressive reaction to the Williams lawsuit by explaining that the lawsuit he filed contains serious allegations against Buzbee’s client, Erin Marzouki. “He called her a thief in a public pleading,” Buzbee told Graham. “He said in a public pleading that she never had any intention of marrying him. He said in a public pleading that she had been the one to break off the relationship. He said in a public pleading that the only reason she was with him was to get his money. And so Buzbee is fighting fire with hellfire, releasing text messages that have limited relevance to the potentially key question of whether Williams or Marzouki broke off the engagement. While the text messages arguably prove that Williams was moody and erratic, which could perhaps support a finding by a jury that Williams ended the engagement and permit Marzouki to keep the $785,000 engagement ring, that’s just cover for what Buzbee is really doing. It’s the Reggie Hammond “let’s see what we can f–k with next” approach. And it often works. In some cases, however, the approach serves only to piss off the other party. Here, it could cause Williams to dig in and spend more than $785,000 in an effort to retrieve the ring. The only good news is that the couple apparently hadn’t registered at Bed Bath & Beyond. When players are drafted by NFL teams, they may have some past allegiances to other clubs to put aside. Sometimes that doesn’t happen quite quickly enough to please fans of their new team. Such is the case for Chargers wide receiver Keenan Allen, who posted a Vine video of himself wearing a Raiders hat while sipping on a drink. The Raiders and Chargers have had a healthy animosity for one another since their days in the AFL and that’s led to some angry reactions from Chargers fans on social media. Lobshots.com has compiled some of these responses (there’s some not safe for work language in that mix) as well as the offending picture, which has since been deleted. Allen has also tweeted out an apology and promise that he won’t be wearing any more silver and black in the future. That’s a prudent fashion choice on Allen’s part, although the phrase making mountains out of molehills does come to mind. While the prospect of an NFL rookie coming into the league to make as a secret agent tasked with taking down an organization makes for a corker of a story, there’s not much chance our fictional Manchurian Candidate would spell out his intentions by wearing another team’s hat in public. Dwight Freeney will be reuniting with Peyton Manning in a different way this season. With the Broncos ultimately dismissing Manning’s effort to get his former Colts teammate to Denver, Freeney will now spend one-eighth of the 2013 season chasing Peyton around. Freeney officially is a Charger, where he’ll remain a 3-4 linebacker for the second straight year. Chances are Freeney will essentially do just that, putting his hand in the dirt and taking on the left tackle in passing situations. He’ll get to do it twice against Ryan Clady, the unsigned lineman who protects Peyton Manning’s blind side. 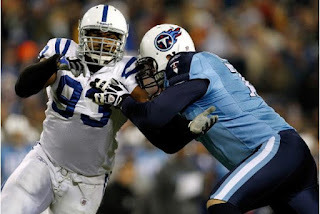 And Freeney will do it against his former team in Indy, along with the other teams he faced every year in the AFC South, starting with the opening Monday night of the season, against the Texans. He’ll also chase around the quarterbacks of the NFC East (including Peyton’s brother Eli, Tony Romo, Robert Griffin III, and presumably Mike Vick). In other words, a relatively mundane offseason for the Chargers suddenly has become far more interesting. A mere possibility quickly has become a probability. Per a source with knowledge of the situation, Patriots tight end Rob Gronkowski “probably” will need back surgery. He currently is waiting for a second opinion from Dr. Robert Watkins. The back surgery, if it occurs, is expected to happen within three-to-four weeks after the upcoming surgery on his forearm, which currently is set for Monday. 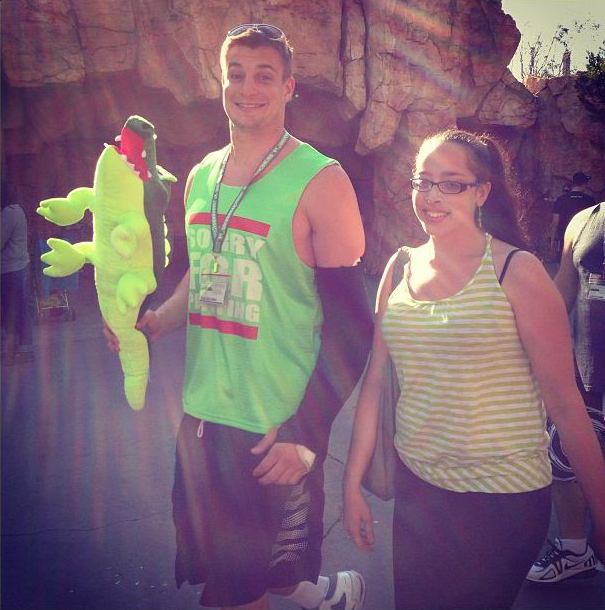 The timetable could hinge on whether the infection is indeed gone from Gronkowski’s forearm. If it is, he’ll need only one more surgery (the fourth) on his arm, and then the back surgery would be able to proceed. If the surgery is still there (doctors currently believe it isn’t), a fifth surgery on the arm may be needed. Which could delay the back surgery. Gronkowski was available in the second round of the 2010 draft due to a back problem that caused him to miss all of the 2009 college football season. 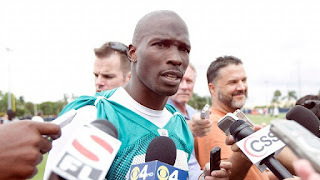 Chad Johnson, whose NFL career came to an end when he was cut by the Dolphins following a domestic violence incident, is once again in trouble in connection with the same incident. A judge has issued a warrant for Johnson’s arrest because he violated his probation by failing to report to his probation officer, a spokesman for the Broward State Attorney’s Office told the South Florida Sun Sentinel. On August 11, Johnson’s then-wife, Evelyn Lozada, said he head-butted her during an argument. 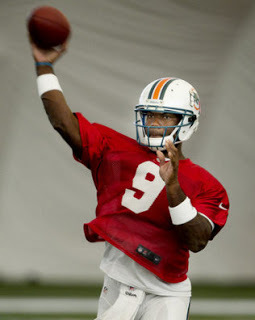 The domestic violence charge led the Dolphins to cut him, as documented on Hard Knocks, and that effectively ended Johnson’s career, as no other team considered Johnson worth the trouble. Johnson eventually pleaded no contest and was placed on probation. He and Lozada divorced in September after 11 weeks of marriage. 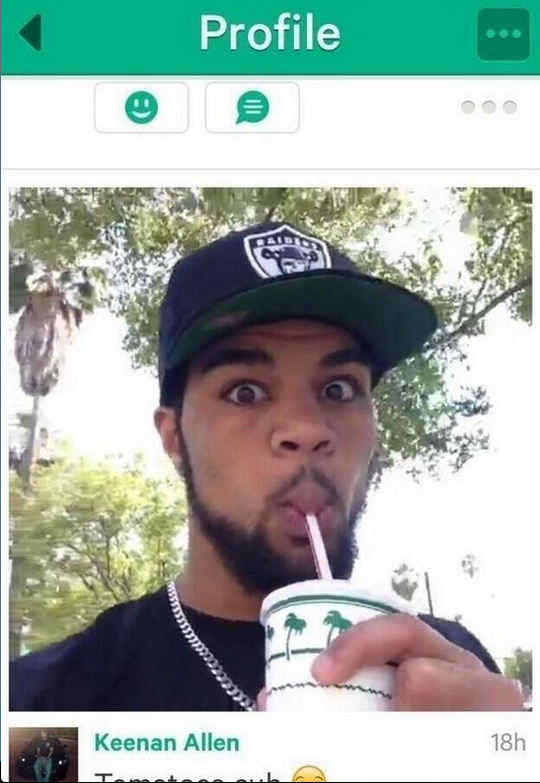 According to comments he posted on Twitter, Johnson is currently in Pasadena. 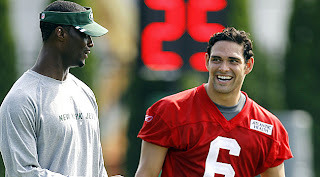 Reports that quarterback David Garrard has been telling teammates with the Jets that he’s leaving the team have been confirmed by Garrard himself. While Garrard wasn’t ready to talk to Jeff Darlington of NFL.com about what was going on, the veteran did text Adam Schein of Sirius XM NFL Radio with a little explanation. Garrard is leaving the Jets’ quarterback competition because his knee, which required an operation after he hurt it with the Dolphins last year, isn’t sound enough to allow him to continue. Offensive coordinator Marty Mornhinweg said earlier Wednesday that he’d like to see a quick end to the quarterback competition, something that could be easier to engineer with one less quarterback taking reps during OTAs and training camp. 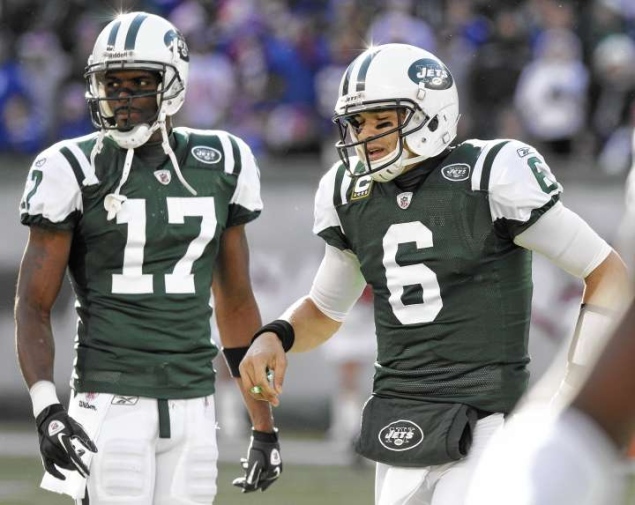 Whether Mark Sanchez or Geno Smith’s chances of landing the starting job are helped more by Garrard’s departure is up for debate, but the departure of the team’s other experienced quarterback would seem to raise the chances that Sanchez sticks around in one role or another this year. The Eagles must have liked what they saw from Felix Jones in last week’s workout. According to Adam Schefter of ESPN, the Eagles have agreed to terms with the former Cowboys first-round running back on a one-year-deal. While you can debate whether Jones was a bust for the Cowboys, he does have a career average of 4.8 yards per carry, and there’s a case to be made that he’ll flourish in space, which Chip Kelly’s offense has always provided for smaller, quicker backs. The Eagles are set for a starter in LeSean McCoy, and Bryce Brown showed flashes when he wasn’t fumbling. But there’s still an opportunity for Jones to create a role for himself. Mark Sanchez may be atop the Jets’ quarterback depth chart right now. But he may not be on the Jets’ quarterback depth chart at all in four months. There’s increasing talk that if rookie Geno Smith looks good this summer, and if veteran David Garrard stays healthy, that the Jets will go into the season with Smith and Garrard as their top two quarterbacks, and go into the season without Sanchez at all. Peter King writes at SI.com that it wouldn’t be surprising if the Jets traded Sanchez or cut him before Week One, while the New York Post reports that the Jets are smitten with Smith and view the starting quarterback job as Smith’s to lose. In fact, the Post‘s Brian Costello believes the only way Sanchez will be a Jet this season is if Smith simply can’t figure out an NFL offense by September and Garrard simply can’t stay healthy at age 35. The problem, of course, is Sanchez’s contract, which guarantees him $8.75 million whether he’s on the Jets or not. But the Post suggests that the Jets might agree to eat about $6 million of that as part of a trade. No team would trade for Sanchez on his current deal, but some team might trade for Sanchez if the Jets are paying most of his salary. Jets coach Rex Ryan has said that Sanchez will get the first snap of the first practice with the first-string offense, and that after that, it’s an open competition for the job. But the competition with Smith and Garrard will be a tough one for Sanchez to win. And if he doesn’t win, he may be done in New York. A white male wearing a Jets jersey under a brown leather jacket robbed two Manhattan banks and tried to rob three others on Friday. The crook got nearly $13,000 at one bank and $2,500 at another. Though surveillance images plainly reveal his face, he remains at large. 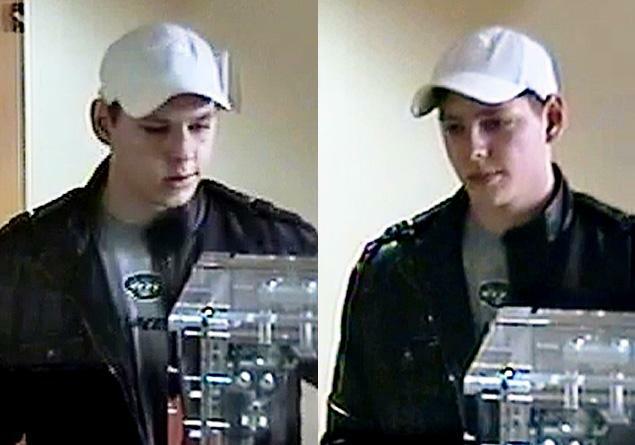 The suspect has been linked to an April 12 bank robbery. That makes him three for six in bank robbery attempts. The suspect reportedly is 25. Coincidentally, former Jets quarterback Tim Tebow is 25. Apart from the fact that likely he has an iron-clad alibi, an accuracy rate of 50 percent is way too high for him. It seems like if you’re having minicamps and installing plans for the coming season, you’d know what the chain of command might be. Apparently not in Dallas. When Cowboys coach Jason Garrett was asked Saturday if he knew who was going to call offensive plays this year, he didn’t offer a concrete answer. 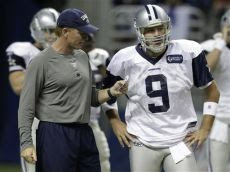 “We haven’t made a decision on that,” Garrett said, via Calvin Watkins of ESPNDallas.com. If that’s true, and Garrett wasn’t just trying to duck an uncomfortable topic, the Cowboys may have bigger issues than imagined. While it’s easy to suggest that it’s just a rookie minicamp, and there’s no need for detailed game-plans at the moment, it still speaks to organizational tension. Garrett would clearly prefer to hang onto his original responsibility, simply because anyone who has ever had a responsibility doesn’t want it taken away. So whether it’s going to be Garrett, Bill Callahan, Tony Romo, or Jerry Jones with a Madden controller in his luxury box, at some point they need to figure it out. A Super Bowl in South Florida won’t have a football game played in an upgraded Sun Life Stadium. But if could have a football game played on an aircraft carrier. 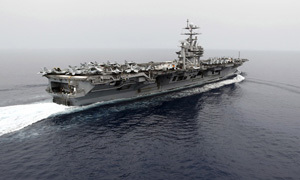 The details of the final bid for Super Bowl L or LI have been released, and the package includes a football game that would be played on an aircraft carrier, according to NBCMiami.com. What they can do is offer a better deal financially to the owners than any other city has offered. Because at the end of the day the primary factor will be money. Like it always is. Ex-Titans wide receiver Lavelle Hawkins has come to terms on a two-year deal with the Patriots, Jim Wyatt of the Nashville Tennessean reported on Thursday. The 26-year-old Hawkins has caught 71 passes for 771 yards and one touchdown in five NFL seasons, all with Tennessee. The Titans released Hawkins on May 1. Hawkins’ most productive season came in 2011, when he hauled in 47 passes for 470 yards and a touchdown in 16 games (two starts). Hawkins (5-11, 194) joins a crowded depth chart in New England. With his addition, the Patriots now have 12 wide receivers in a revamped group led by ex-Rams slot receiver Danny Amendola. Also, the Patriots drafted a pair of receivers, selecting Marshall’s Aaron Dobson in Round Two and Texas Christian’s Josh Boyce in Round Four. The fashionable thing to say for men who run drafts is they'll set their boards and honor them and take the best player available. I believe general managers approach drafts that way, but when it comes time to pull the trigger, they're going to pay more attention to positions of need than they'll admit. They should. If you're set with two good young tackles, why pick a tackle, just because the top guy on your board is a tackle? Consistently over the years, the Baltimore Ravens have drafted for need while not bastardizing the integrity of their draft board. In 2008, GM Ozzie Newsome knew the strength of the draft wasn't at quarterback (except for Matt Ryan) or running back, but he knew he needed help at both positions. He maneuvered through two trades, picked Joe Flacco at 18, waited for the running backs to fall to him at 55, and got Ray Rice there. Without those two picks, there's little chance the Ravens would have won the Super Bowl in February. • Safety. Baltimore let both starting safeties, Ed Reed and Bernard Pollard, walk, figuring one of the safeties it liked -- Matt Elam or Johnathan Cyprien -- would be there when it picked late in the first round at 32. If not, the Ravens would address their major need at linebacker after losing Ray Lewis and Dannell Ellerbe. They got Elam at 32; lucky for them, because Cyprien went 33rd to Jacksonville. • Linebacker. A great leader, Lewis, was lost. A potential leader, Arthur Brown, was found, at 56 overall in the second round. The Ravens, as I wrote last week, heard reliably that Houston (drafting 57th) and Denver (58th) were interested in Brown, so they traded ahead of them to get Brown. This is a leader: Brown played for two years at Kansas State -- and was elected captain both years. The other linebacker they picked was a two-year captain, at Ohio State, and coach Urban Meyer called John Simon (fourth round, 129th) the second-favorite player he has coached (behind Tim Tebow). Ohio State defensive aide Mike Vrabel sold the Ravens -- and any other team that would listen -- on Simon's pro capabilities as a strongside NFL linebacker who could also play inside. • Fullback. The Baltimore fullback will play about 45 percent of the offensive snaps, more than on most teams, and Vonta Leach turns 32 this year. Time for an heir. But from Harvard? Kyle Juszczyk (fourth round, 130th overall) stood up the best pass rushers with some stonewall blocks at Senior Bowl practices and in the game, proving to Baltimore he can be the personal protector for Ray Rice and Bernard Pierce when the time comes. 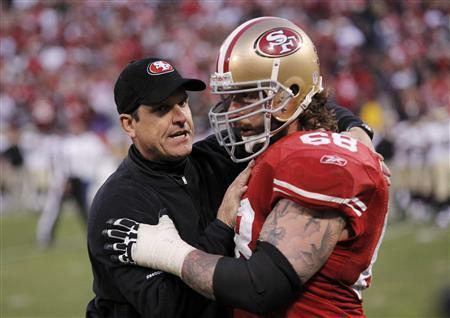 "We really went to the hardware store this year in the draft,'' said Harbaugh. That leaves one major position of need. Baltimore didn't take a wide receiver until the seventh round (Aaron Mellette, Elon), so the Ravens, obviously, still will be mining for one before training camp starts. The only mistake I can see that the Ravens made this offseason was letting a $2 million financial disagreement with a vital player, wideout Anquan Boldin, lead to him being traded to San Francisco. I'll never agree with that one. Smart teams find a way to make up for losses like that, but that's a big one to overcome. Look for Baltimore to be more tight-end oriented if a prospect like Tandon Doss doesn't step up to the pressure spot in training camp. The Cardinals are hoping that Tyrann Mathieu comes to Arizona without the marijuana problems that sank his career at LSU. One local business is hoping that the opposite is true. 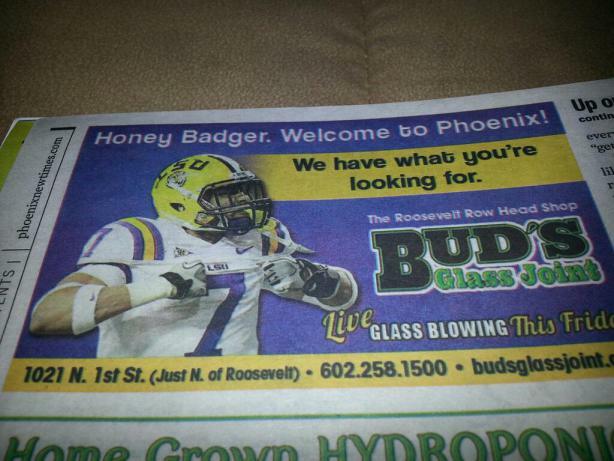 Bud’s Glass Joint, a head shop in Phoenix, took out an ad in the Phoenix New Times that welcomed Mathieu to town while also informing him that their shop has him covered for any weed-related needs that should come up once he reports to work with the Cardinals. The ad, which can be seen at right via NESN.com, features a picture of Mathieu in his LSU uniform and refers to him by the Honey Badger nickname that Mathieu has said that he’d like to see retired as he moves onto the next stage of his football career. We’d imagine he’d also like ads from head shops linking him to marijuana to go away, but more time is going to have to pass before people stop immediately thinking of marijuana when Mathieu’s name comes up for discussion. Does the Honey Badger care about his image being used to promote a head shot? We don’t know, but we imagine the only thing that might upset his agents and lawyers more would be if Mathieu actually showed up for a live glass blowing exhibit. Whether you find the ad funny or in poor taste, you can’t argue with the marketing savvy shown by the heads behind the head shop by linking their ad to Mathieu. They’re getting a lot more eyeballs than one expects when paying for an ad in an alternative newspaper. 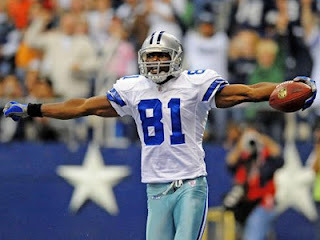 T.O. wants Pats, who don’t want T.O. Three Super Bowl champions have been crowned since the last time Terrell Owens played in a regular-season NFL game. And yet he still talks about coming back. And the media still reacts when he does. By the way, is that a worm? That worm looks tasty. And it definitely doesn’t look like its body has been repeatedly impaled on a hook that will be buried into my cheek and used to yank me mouth first into a boat. Anyway, Owens recently explained to BlindsideFootball.com his level of interest in joining the Patriots. His interest may be a no-brainer, but the issue is a non-starter. The Patriots have no interest in Owens, as Jeff Howe reported last month on the always-free Boston Herald website after Owens played pitch-and-catch with Brady in the vicinity of Castle Bundchen. Actually, no team has any interest in Owens. The Seahawks gave him a chance last year, but he didn’t make it past the first wave of roster cuts. Since then, there have been no offers, workouts, meetings, anything. So until someone signs him or displays any/some interest in Owens, we’ll consider him to be involuntarily retired. The only question is whether three more Super Bowl champions will be crowned before it becomes a voluntary retirement. Cowboys owner Jerry Jones says quarterback Tony Romo needs to adopt a Peyton Manning-style work ethic. But Romo’s good buddy and teammate Jason Witten says Romo already does plenty. Asked about the Cowboys’ plans to have Romo more involved in the game planning, Witten said he has always thought Romo had a strong command of the offense. Witten thinks people who have linked Romo’s new six-year, $108 million contract to a need to work harder don’t realize that Witten already works hard. Whatever anyone else says about Romo, he knows he’ll always have Witten in his corner. The ongoing debate about how a gay NFL player would be treated in the locker room has largely focused on the idea that times are changing, and that acceptance of a gay player would be a modern development. But it’s often overlooked that the ultimate example of the old-school football coach was also perfectly fine with having gay players on his team. Multiple players who played for Vince Lombardi, the legendary former Packers and Redskins coach, say that he knew some of his players were gay, and that not only did he not have a problem with it, but he went out of his way to make sure no one else on his team would make it a problem. Lombardi’s daughter Susan told Ian O’Connor of ESPNNewYork.com that her father would have been thrilled to have a player like Jason Collins, the NBA center who publicly revealed this week that he is gay. Dave Kopay, the first former NFL player to come out, also played on those 1969 Redskins, and he says that while he never told Lombardi, he believes Lombardi knew not only that Kopay was gay, but that Kopay and another Redskins player, Jerry Smith, were in a romantic relationship. “Lombardi protected and loved Jerry,” Kopay told O’Connor. 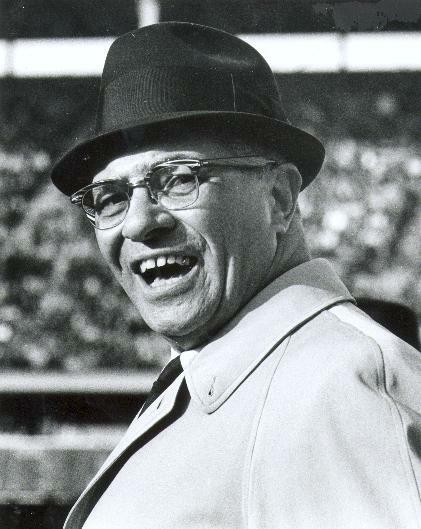 Lombardi’s brother Harold was gay, and when Harold died in July of 2011 he was survived by his partner of 41 years — meaning their relationship began just before Vince died in September of 1970. As noted by Doug Farrar of Yahoo! Sports, Vince knew Harold was gay and didn’t just believe in “tolerance” but believed strongly that discrimination against gay people was wrong, just as he was angered when he saw mistreatment of his black players, or discrimination against his fellow Italian-Americans. If a coach who was considered old-fashioned even by the standards of the 1960s accepted gay players in his locker room, the idea that gay players couldn’t be accepted in an NFL locker room in 2013 is both silly and sad. The Jets made players available to the media today in an open locker room setting, and you know what that means — open season on the quarterback. Even though the job that once was his alone is now said to be up for competition, Jets quarterback Mark Sanchez (wearing a jaunty headband, because of course he is) said he isn’t backing down from second-round pick Geno Smith’s presence, or anyone else’s. Sanchez also said the five-deep quarterback room was a friendly atmosphere, even if it’s a little crowded in there with himself, Smith, David Garrard, Greg McElroy and Matt Simms (minus you-know-who). He mentioned that offensive coordinator Marty Mornhinweg was on the phone with him before and after they drafted Smith, showing the lengths they’re going to to manage an untenable situation. This is only going to get better and better. Jets General Manager John Idzik and coach Rex Ryan were busy men on Tuesday, giving interviews to just about everyone this side of Jerry Springer. As you’d probably imagine, the majority of the questions were about the menagerie of quarterbacks the team has accumulated over the years. Somewhere amid the goodbyes to Tim Tebow and promises of a competition between the remaining players, there was some discussion of other spots on the team as well. One of them was wide receiver, a spot the Jets did not address during the draft even though they are currently relying heavily on a full recovery from Santonio Holmes and rapid improvement from Stephen Hill. Idzik was specifically asked about the possibility of a return from Braylon Edwards, who played the final three games of the season with the Jets after getting waived by the Seahawks. Idzik was in Seattle last year, knows Edwards and said that the veteran was on the radar for a third spin with the Jets. “I know [Edwards] very well. 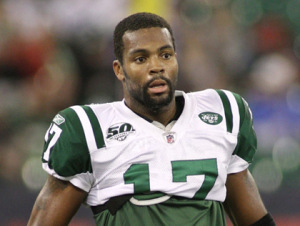 Guys like that would be under consideration as we go forward, for sure,” Idzik said, via Rich Cimini of ESPNNewYork.com. Edwards, who had 10 catches after arriving back with the Jets, isn’t the only option. Mike Garafolo of USA Today reports that the team has had conversations with former Giant Ramses Barden about coming on board as a free agent. Barden had 29 catches in four years with the Giants — nine of them in one 2012 game — and hasn’t seen much interest in his services so far this offseason.